We are leading Manufacturer of Wireless Transmitter and our product is made up of good quality. ZGE201 is a wireless transmitter used to measure the temperature of a RTD sensor & transmit it to a wireless receiver ZGB201 connected to a PC for data logging. The ZGB201 wireless receiver is a compact device that recevies the transmitted signals from ZGE201, ZGE202, ZGE203 Transmitter & ZGB202 Router & display / log / Graph the data on your PC. ZGU201 software is included with each unit for displaying Ambient temperature, Process value, along with RF signal strength & battery condition. ZGE202 is used to measure the temperature of a thermocouple & transmit it to a wireless receiver ZGB201 connected to a PC for data logging. ZGE203 is a wireless transmitter used to measure the Relative Humidity and Temperature and transmit it to a wireless receiver ZGB201 connected to a PC for data-logging. The ZGB202 wireless Router is a compact device that receives & retransmit signal to the host. 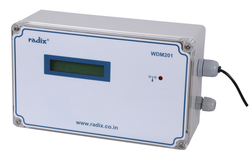 WDM201 is a Data Acquisition Module designed to allow remote monitoring of flow rate and liquid volume using wireless GPRS technology. Locations that were previously hard to access, such as water tanks in a village, buildings, machinery,infrastructure or moving vehicles can now easily be accessed and monitored. 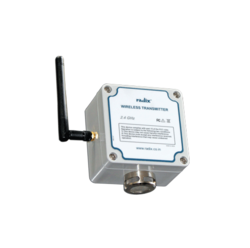 WDM201 is a specially designed low power battery-operated GPRS modem to acquire data of flow rate and liquid volume from a liquid flow/storage system. This information is transmitted in real time using the GPRS network of any commercial service provider to a Web-based Server.The data is stored in a central database, and can be accessed by a PC for recording, viewing and assessment. 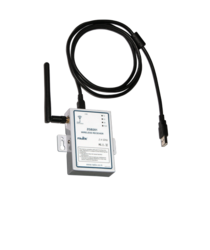 ZGE205 is a wireless transmitter used to measure the level of liquid and transmit it wirlessly to the receiver ZGB201 or ZGB203 conntected to a PC for datalogging. The level sensor design can be made to customer specifications. It consists of a guide tube, float & housing with electronic transmitter circuitry. The level signal is measured by the sensor. 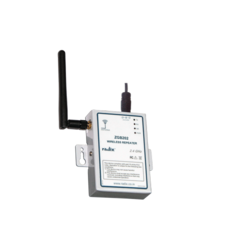 The wireless transmitter transmits level, % level, transmitter internal, temperature,wireless signal strength and battery condition to a receiver ZGB203 or ZGB201 after the pre-defined transmission interval and data logging. 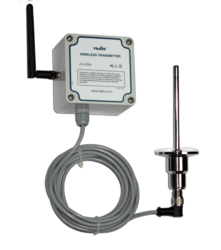 Looking for Wireless Sensors and Transmitters ?